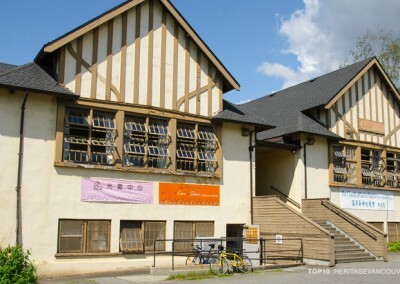 In 2016, Vancouver School Board (VSB) made a decision to demolish another historic school, Sir Sanford Fleming School, in favour of replacement by a new school. Which school is next on the hit list? David Lloyd George Elementary School (8370 Cartier Street) is a historic landmark in the Marpole neighbourhood. Architectural firm, Twizell, Twizell & Birds, prolific in school design, were the architects for the 1921 Classical Revival brick building, and Duncan McNab designed the 1954 Modernist gymnasium addition. Since our Top Ten last year, the VSB Long Range Facilities Plan has been approved. Lloyd George Elementary is included in a list of 19 schools that the plan identifies as immediate priorities for seismic upgrades. 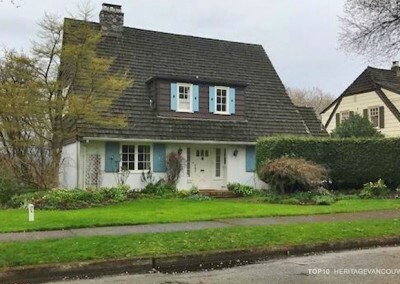 Eleven of the 19 schools, including David Lloyd George, are listed on the Vancouver Heritage Register, but this does not provide any protection from demolition. 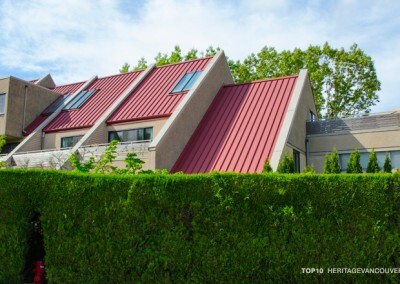 Until the VSB includes a heritage value assessment of each heritage school as an integral part of the seismic mitigation process, these buildings will continue to be threatened. Numerous historic schools valued in our communities have already been lost. With creative solutions, essential seismic upgrades can be achieved without resorting to the demolition of heritage schools that are valued in neighbourhoods. What is the threat to David Lloyd George Elementary School? 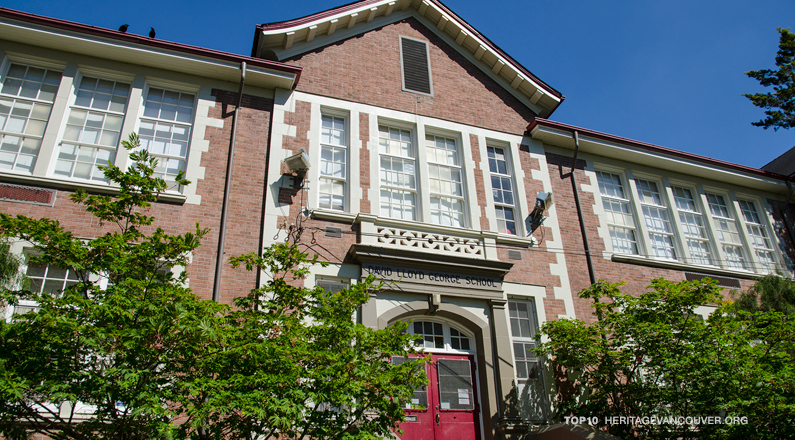 The immediate threat to Vancouver’s heritage schools is the provincial seismic mitigation program and the way it is being implemented by the Vancouver School Board. Since the late 1980s, the Ministry of Education has acknowledged the need for seismic upgrading to public schools to provide for public safety in the buildings. To date, over 150 seismic upgrade projects across British Columbia have been completed or construction is in progress. However, as of 2016 only 20 of Vancouver’s 110 schools have been seismically improved, and 5 are being built, but 64 additional high-risk schools need seismic upgrades. Of these, a total of 24 buildings have an approved seismic work plan, leaving 40 that the Ministry has yet to approve. According to the Ministry of Education, all of the high-risk schools that have not yet received attention are located in Vancouver. 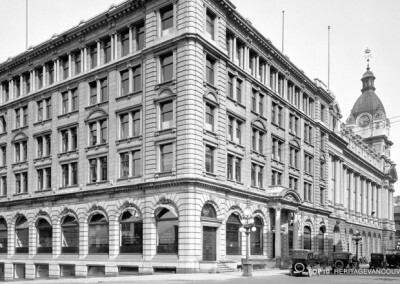 Other communities in BC, including Victoria with its many historic schools, have seismically upgraded buildings without resorting to widespread demolition. Lack of adequate funding is the reason that the VSB has given for not being able to retain heritage schools that require seismic upgrades. However, the capital costs for upgrading have compounded over the years directly because the VSB chose to defer the necessary improvements to these schools. The VSB also claims that old schools are not suited to support contemporary learning environments (e.g. multi-media labs) which is a bias leading to abandonment of heritage buildings. VSB approved its updated Long Range Facilities Plan in May 2016. One of the decision criteria was to increase the rate of school use versus capacity, from the 2016 level of 85%, to the Ministry of Education’s target of 95%. According to the VSB, this higher threshold for funding support could force the closure of 12 or 13 schools in future. This puts further pressure on heritage schools that are currently underused, such as Carleton School, 3250 Kingsway, with a rate of only 50%. 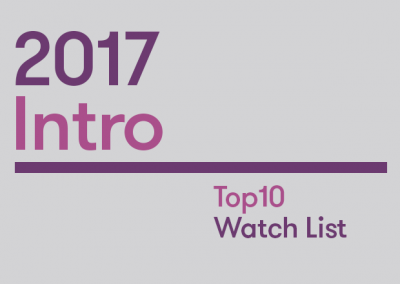 See our 2011 Top10 List for a description of the four heritage buildings, dating from 1896 to 1912, which comprise the large Carleton School complex. Many cities have managed to modernize and seismically upgrade their schools without this level of destruction of community heritage resources. 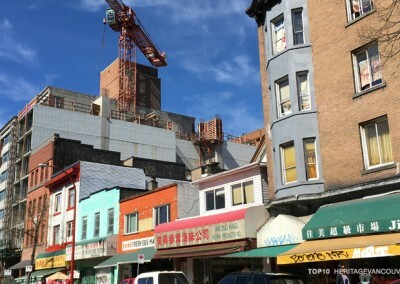 In the past, the VSB often did not engage heritage professionals until after internal decisions were already made to replace the school facility. During the Long Range Plan update process, VSB created a Heritage Consultation Committee to help guide decisions for each heritage school and to identify heritage schools in the future. With professional advice from Heritage Consultation Committee members, the VSB should explore all options rather than defaulting to demolition or, if that is not feasible, to retain the most significant features of heritage school buildings. Unless the VSB seismic upgrade process is changed to include heritage value assessments for high-risk schools, they will remain threatened with demolition. Why is David Lloyd George Elementary School significant? Lloyd George Elementary School is significant for its aesthetic, historical and continued social value. 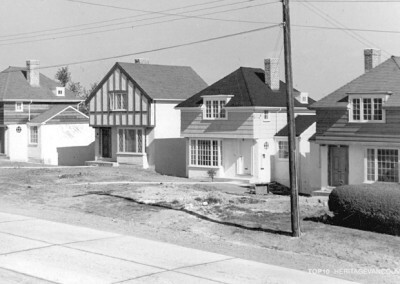 This 1921 brick building is a highly-visible landmark in the neighbourhood, and one of Marpole’s few surviving public buildings with historical value. Designed by prominent architects Twizell, Twizell & Birds, this building is a fine example of a Classical Revival brick school constructed after World War I. The building has a symmetrical single corridor plan with classrooms and staffroom along each side (referred to as a ‘Barbell Plan’), and originally had a two-storey auditorium with impressive roof trusses in the centre. The main roof form is hipped, with end and centre gables. 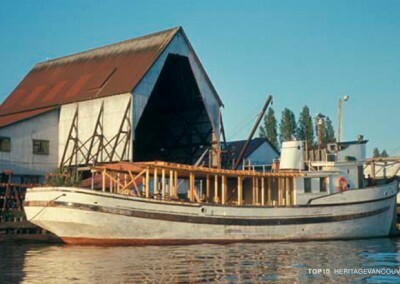 Building materials and methods are representative of 1920s schools in Vancouver, as seen in architectural elements such as: concrete post-and-beam skeleton; poured-in-place concrete flooring overlaid on structural clay tiles; brick cladding; and a wooden roof structure. All these details are common to schools by Twizell, Twizell & Birds in Vancouver, including: Shaughnessy; Kitchener; Edith Cavell; Kerrisdale; and Queen Mary. The school’s auditorium addition, 1954, is significant for its association with significant modernist architect, Duncan McNab. He initially worked for Thompson, Berwick and Pratt, and founded his own practice in 1949. Soon afterwards, the provincial Department of Education hired McNab to create standards for school design and construction. His 1954 addition is an example of contemporary style, seen in such features as a flat roof with glulam structure, board-formed concrete walls, and horizontal bands of windows with inset glass block. Built shortly after World War I, the school is also important for being named after the British Prime Minister at that time, David Lloyd George. 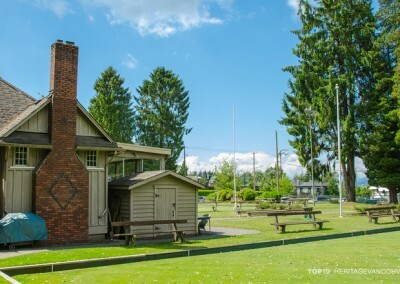 It has long-standing and continuous value for its presence as a landmark, for the grounds as a park and playground, and for extensive use of the building for community activities to such an extent that the school is nicknamed the Honourary Mayor of Marpole. Heritage Vancouver supports the retention and upgrade of the David Lloyd George Elementary original 1921 building. We encourage VSB to both hire a heritage professional to prepare a Conservation Plan before any seismic options are considered, and engage the Heritage Consultation Committee at every phase in the process. Heritage Vancouver believes that heritage professionals can help ensure that appropriate decisions are made regarding significant community heritage assets, and that the renewal of heritage schools can be successfully achieved through adherence to conservation principles. 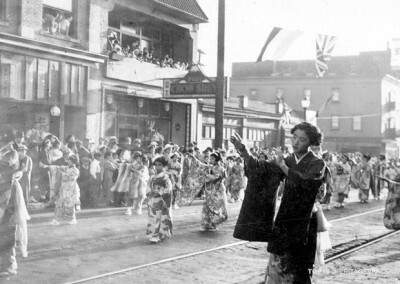 We further encourage the VSB to provide commemorative information about the historical value of Vancouver’s heritage schools to the public, students and staff. Ask the Vancouver School Board (VSB) for information on the future of your neighbourhood school, or a school that you attended. Find out more about the history of schools that you do not want to see lost through demolition. Become involved with a group in your community, your PAC, Community Association, or other group, which is engaged in a VSB seismic upgrading process, and let the VSB know which schools should not be demolished. Write to the provincial and municipal governments letting them know that you wish to see heritage schools retained as part of the seismic upgrade strategy. Contact municipal political parties, provincial representatives or the School Trustee, and ask them to outline their position on the retention of heritage schools.